A little girl played dress up while singing "Here comes the bride." Her mommy watched with delight and thought about that day, many years from now, she would walk down the aisle. Then one day that little girl was asked "Will you marry me?" Her mommy wondered how could this be? Just yesterday she was my little girl playing dress up while I imagined her wedding day..."
Halloween was always hand-designed in the Hunt house. Brielle, at 5 years old, in her wedding gown costume with a dreamy lace train, puffy satin sleeves, and cascading bouquet....every little girl's dream! I have designed many garments for my children since the day they were born. Their christening gowns were made from scraps of fabric from my own wedding gown design. In addition to Halloween costumes, some of my favorite creations have been special occasion dresses for Brielle and Aubrey. 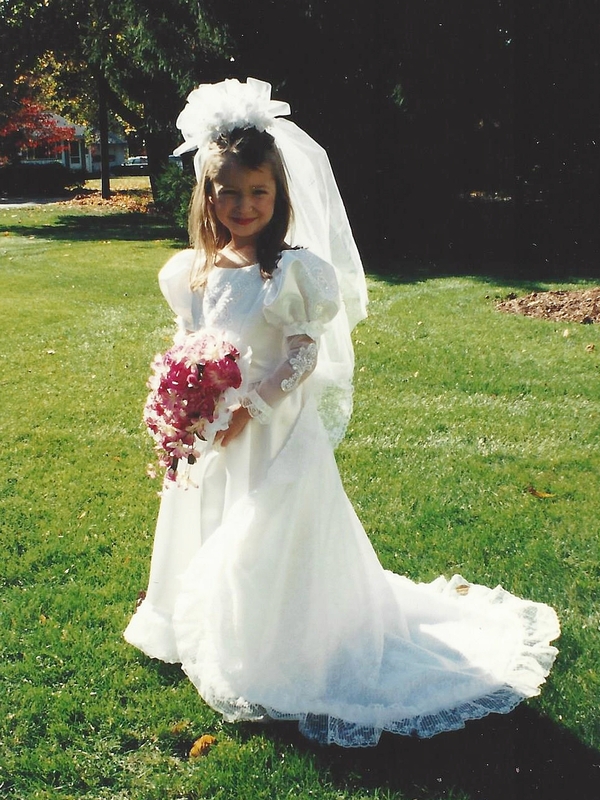 Brielle was a flower girl in 1995. Her silk duppioni dress was designed to match her cousin's wedding gown silhouette. Hand gathered silk petal flowers adorned the dress. Brielle's holy communion dress and headpiece were designed from silk taffeta, silk organza, and French Guipure lace. Her 1997 dress design was a classic and could still be worn today. In 2011, Brielle's dress design for Ring Dance at the University of Richmond used the finest French Chantilly lace from the same lacemaker Kate Middleton used for her royal wedding gown. A toast between the bride-to-be and maid of honor began the day. Brielle invited her Aunt Lorraine from Florida to join us for a girls weekend wedding dress adventure. We began in New York City enjoying lunch at Gigino Trattoria just blocks from the Freedom Tower. Brielle and I had been exchanging pics on Instagram of different dress designers we liked. We found a common link with designer Alexandra Grecco. Lovely Bride on Duane Street was having a trunk show the weekend Brielle was coming home. This would be a perfect opportunity to see @alexandragrecco Instagram images come to life. We arrived promptly for our one hour appointment at 1 p.m. The staff at Lovely were welcoming. They were running about fifteen minutes behind so we sat comfortably in the reception area and noticed their beautiful Trunk Show chalkings were not up to date. It was September 16th, and the boards hadn't been changed from the August show dates. It's ok...everyone falls behind once in awhile. We were just happy to be there. Loved the geometric nature of this dainty bodice! Different necklines, bodices, fabrics, and silhouettes were ready for the fitting room. As a designer, I had many questions. Quality and craftsmanship were key if Brielle decided to buy her dress. The next leg of our journey began early the next morning. It proved to be a stark contrast to our Lovely Bride experience. As sweet as the staff was at Lovely Bride, I knew there was something more out there. We packed our bags and headed north to Saratoga Springs, NY. We made an appointment with Denise Eliopulos, the owner of Something Bleu Bridal. My business relationship with Denise began in 1999, when headpiece.com was the sole U.S. distributor for Joyce Jackson Bridal Veils of Wales. Since then, Something Bleu Bridal has become a top retailer of our Marie Teresa bridal headpiece and veil line. I knew this was where we would find quality, knowledge, and real integrity. Something Bleu Bridal is located in a Saratoga mansion which was originally the family home of Dr. Grant and built in 1884. Denise had incredible vision when she moved her original Immortal Beloved Bird of Paradise Boutique Est. 1981 from downtown Saratoga to this architecturally romantic space. Something Bleu now takes up the entire second floor of the mansion. To preserve the beauty of the gowns shoes are removed before entering this enchanting old world, dream-like bridal salon. 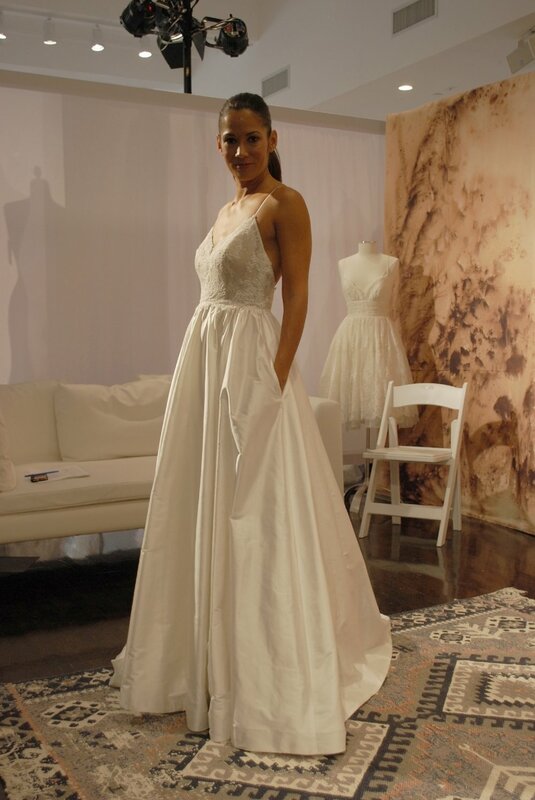 Canadian designer Lea-Ann Belter had a premiere presence at Something Bleu Bridal. Lea-Ann designs two collections "Lea-Ann Belter Bridal" and "Astrid and Mercedes". Denise was the first retailer to receive the 2017 Astrid and Mercedes collection to show. The 2017 Lea-Ann Belter Bridal collection was still in the design stages readying for its debut at Bridal Week which would take place two weeks later in New York City. Brielle would be the first bride at Something Bleu to try Lea-Ann's wedding gowns from her brand new Astrid and Mercedes line. Every dress was incredible! The "Enchanting" gown from Astrid and Mercedes. "Cherished" was an Instagram favorite of ours. Our beautiful two tier cascading French lace "DeMare" veil shown over an Astrid and Mercedes gown. Box pleats, pockets, and a lace back...true love! A gentle, wispy and romantic skirt. Bridal Week in New York City was the same weekend of our engagement party for Brielle and Alex. If the stars aligned, Brielle could attend with me on Monday, October 10th. This was not to be. Maid of honor, Aubrey, attended in her place. We joined Denise and met with designer Lea-Ann Belter to see the unveiling of her 2017 Lea-Ann Belter Bridal collection. The result would prompt Brielle to book a flight back to NJ. We were in the right place for quality and craftsmanship. Silk, fine lace, pockets, peplums, and horsehair are included in every chapter of Lea-Ann Belter's design book. Her silhouettes are classic while crisp and fresh. Denise and Katie kept in contact with Brielle in Richmond, Virginia, hoping she would find her wedding day look from Lea-Ann Belter's 2017 stunning collections. Meet the incredibly talented designer Lea-Ann Belter! There is nothing more beautiful than a crisp horsehair hem to dance and sweep across the floor as a bride moves. By the end of market, Aubrey and I agreed Lea-Ann's showing was the only one that felt right. If someone other than me were to design Brielle's dress...I think designer Lea-Ann Belter might be the perfect one! Brielle agreed and booked a return flight for the first weekend in December. On December 2nd, we returned to Saratoga Springs focused and excited to see Brielle try the newest gowns from Lea-Ann Belter Bridal collection seen at bridal market. Brielle would decide by the weekend's end what she would wear on her wedding day...and who would design it. Brielle and I wished we could spend several days in Saratoga Springs. We didn't have the time to explore all this magical city had to offer. Saratoga Springs is a two hour and thirty minute drive from our NJ home. Both of our visits were brief overnight stays due to our work schedules. Lake George and the beautiful Adirondack Mountains are just a short drive beyond Saratoga. We made sure every minute we spent together in Saratoga was fun and memorable! After our first appointment at Something Bleu, Brielle and I enjoyed a late lunch and a little wine at Scallions. We share the Scallions Flatbread and the Turkey and Brie. It was so good, we returned for brunch with Denise the next day. Denise suggested dinner at Mouzon House. Katie, Denise, me, and the bride-to-be enjoyed dinner, wine, talk, and pics in this quaint house filled with artwork. Our spacious studio suite was homey at the Pavilion Grand Hotel. We took a power nap after arrival to ready ourselves for a great dinner in Saratoga Springs. Denise and Katie arrived before dinner and we popped a bottle of champagne. Who doesn't like a souvenir? Pastries from Mrs. London's and chocolates from Kilwins changed our trip status from an overnight to a luxuriously delectable overnight! Lee-Ann Belter's "Judith" gown left me breathless! I still react that way everytime I look at these two pictures of Brielle. Saratoga Springs, New York, left a mark on the map. Something Bleu Bridal, left an impression of what the wedding gown shopping experience should be. Denise and Katie, left a mark on our hearts. Designer Lea-Ann Belter, left a vision of bridal beauty and style for Brielle's wedding day. So happy to have known Denise for all these years. She is gifted at finding what is inside the heart and mind of every bride for her wedding day. We hope to see Denise on October, "Fourteenth" in Richmond, Virginia. Sybil, Denise's parrot (and love), knows exactly what dress Brielle chose and could perfectly verbalize it. That is why we left out the video of Sybil in this blog. Now it is time for me to begin design on my special dress for October the... "Fourteenth".